Large-cap stocks are inching higher on Monday, continuing the push they’ve enjoyed over the past couple of weeks led largely by the mega-cap technology stocks in the Nasdaq Composite — which has enjoyed a rally to new record highs. The rest of the market, however, has lagged behind. The pressure keeping performance in check comes amid a drag in the markets’ weakest areas, including consumer staples and yield-sensitive equities, such as utilities and telecoms. That’s good news for value-hunting investors, though, who are piling into these stocks in droves, setting the stage for impressive turnarounds. 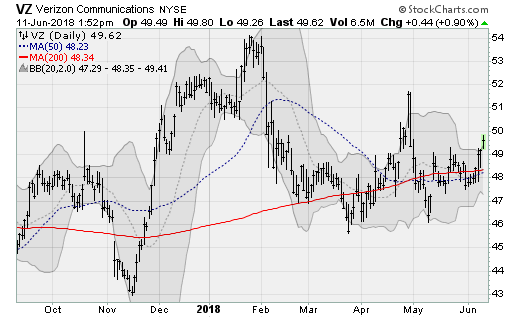 Procter & Gamble (NYSE:PG) shares are rising off of a three-month consolidation range to arc back above its 50-day moving average returning to levels not seen since April. Consumer products stocks like PG have been under pressure for months amid margin pressure from higher costs and limited ability to pass through the increases to consumers amid intense competition from store brands and online retailers. The company will next report results on July 26 before the bell. Analysts are looking for earnings of 91 cents per share on revenues of $16.7 billion. When the company last reported on April 19, earnings of $1.00 per share beat estimates by a penny on a 4.3% rise in revenues. 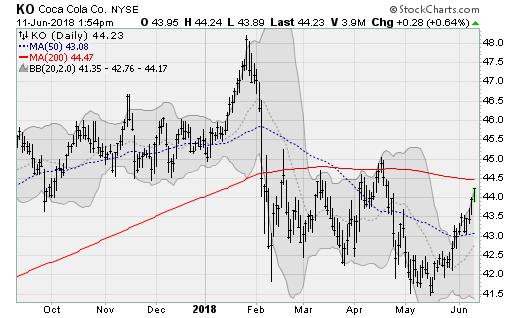 Travelers (NYSE:TRV) shares are consolidating below their 200-day moving average and look ready to break to the upside, setting the stage for a return to highs last seen in March as financial stocks, in general, receive a lift here. The company will next report results on July 19 before the bell. Analysts are looking for earnings of $2.44 per share on revenues of $6.7 billion. When the company last reported on April 24, earnings of $2.46 per share missed estimates by 23 cents. 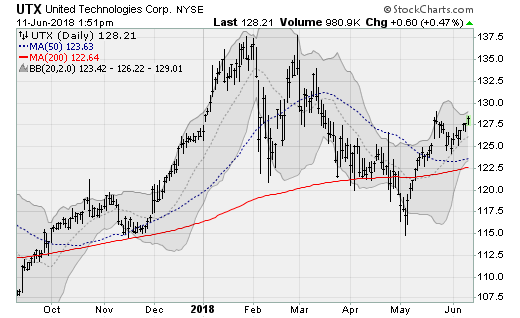 United Technologies (NYSE:UTX) has bounced twice off of its 200-day moving average and looks set for a rally back to its March highs, which would be worth a gain of more than 5% from current levels. The company is set to rise on exposure from defensive spending (jet engines) but also from any possible clarity on trade tensions between the U.S. and China/NAFTA. The company will next report results on July 24 before the bell. Analysts are looking for earnings of $1.84 per share on revenues of $16.2 billion. When the company last reported on April 24, earnings of $1.77 beat estimates by 26 cents on a 10.3% rise in revenues. Verizon (NYSE:VZ) shares are emerging from an upward-tilting consolidation range going back to February. 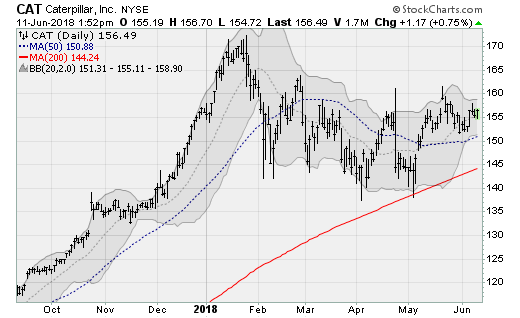 This continues a sideways range that has been in play since 2016. Analysts at JPMorgan upgraded shares back in May ahead of what is expected to be a big iPhone upgrade cycle this year (new phones, lower price points) and the fact that industry consolidation is likely to relieve some of the competitive pressures being seen on price. The company will next report results on July 24 before the bell. Analysts are looking for earnings of $1.15 per share on revenues of $31.7 billion. When the company last reported on April 24, earrings of $1.11 per share matched estimates on a 6.6% rise in revenues. 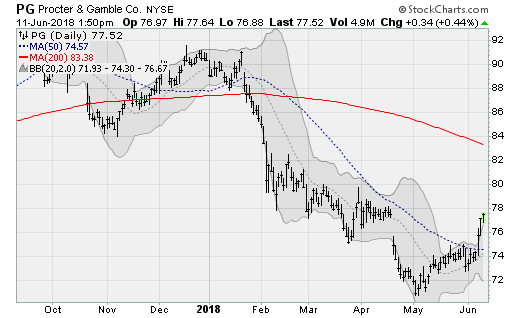 Caterpillar (NYSE:CAT) shares look ready for a rise above double-top resistance near $160 ahead of a possible run to prior highs near $170 — which would be worth a gain of roughly 10% from current levels. The company’s fortunes have risen and fallen based on the outlook for trade deals between the United States and its trading partners. Hopes are rising that an agreement with North Korea this week (on denuclearization) could spur a broad deal with China. The company will next report results on July 30 before the bell. Analysts are looking for earnings of $2.72 per share on revenues of nearly $14 billion. When the company last reported on April 24, earnings of $2.82 per share beat estimates by 72 cents on a 30.9% rise in revenues. 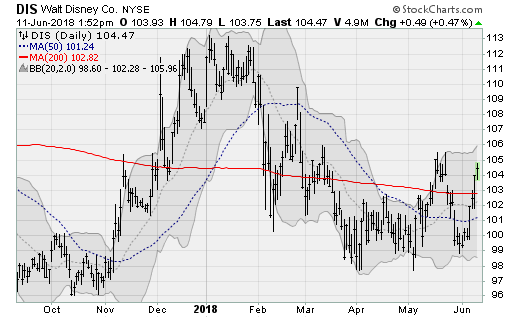 Walt Disney Co (NYSE:DIS) shares are rising off of support near the $100-a-share level, moving above the 200-day moving average ahead of what’s likely to be a run at the January high near $113 — which would be worth nearly a 8% move from here — as hype builds for the Incredibles 2 due out this week. The company will next report results on Aug. 7 after the close. Analysts are looking for earnings of $1.96 per share on revenues of $15.4 billion. When the company last reported on May 8, earnings of $1.84 per share beat estimates by 14 cents on a 9.1% rise in revenues. 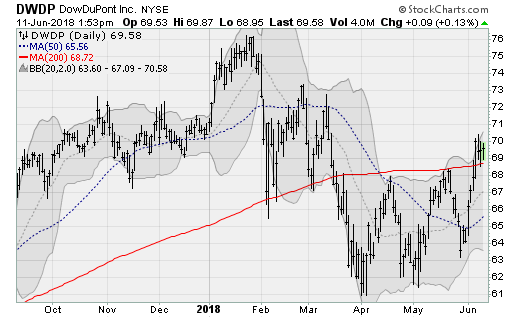 DowDuPont (NYSE:DWDP) shares are rising over their 200-day moving average, exiting a multi-month consolidation range, as traders look for margin relief thanks to the recent cooling of crude oil prices. As a reminder, chemical companies have petroleum as a key expensive item. So the decision by OPEC to consider easing their production cap at their policy meeting later this month is set to provide badly needed relief. The company will next report results on Aug. 2 before the bell. Analysts are looking for earnings of $1.27 per share on revenues of $23.6 billion. When the company last reported on May 3, earnings of $1.12 per share beat estimates by three cents on a 62.6% rise in revenues. 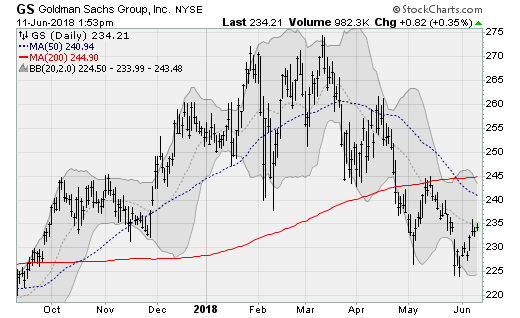 Goldman Sachs (NYSE:GS) shares have been in a persistent downtrend since March after the initial excitement over higher long-term Treasury yields gave way to a more measured response including healthy concern over the health of the bond market. Particularly, high-yield bonds, which are poised to suffer losses in response. But with the economy continuing to grow strongly, these concerns are fading now. The company will next report results on July 17 before the bell. Analysts are looking for earnings of $4.57 per share on revenues of $8.6 billion. When the company last reported on April 17, earnings of $6.95 beat estimates by $1.38 on a 25% rise in revenues. 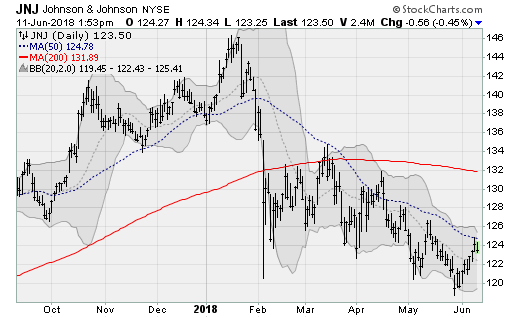 Johnson & Johnson (NYSE:JNJ) shares are set for a lift as the broader healthcare sector lifts up and out of a multi-month consolidation range. Watch for a run at the 200-day moving average, which would be worth a gain of more than 7% from current levels. The company will next report results on July 17 before the bell. Analysts are looking for earnings of $2.06 per share on revenues of $20.4 billion. When the company last reported on April 17, earnings of $2.06 beat estimates by six cents on a 12.6% rise in revenues. 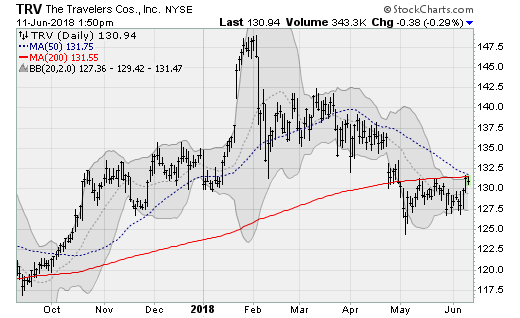 Coca-Cola (NYSE:KO) shares have rallied nearly 10% off of their mid-May lows to make a run at the 200-day moving average, moving to the upper end of a multi-month consolidation range rising the tailwind of an upgrade from Barclays analyst at the end of May. The company will next resort results on July 26 before the bell. Analysts are looking for earnings of 61 cents per share on revenues of $8.6 billion. When the company last reported on April 24, it reported earnings of 47 cents per share beating estimates by a penny. 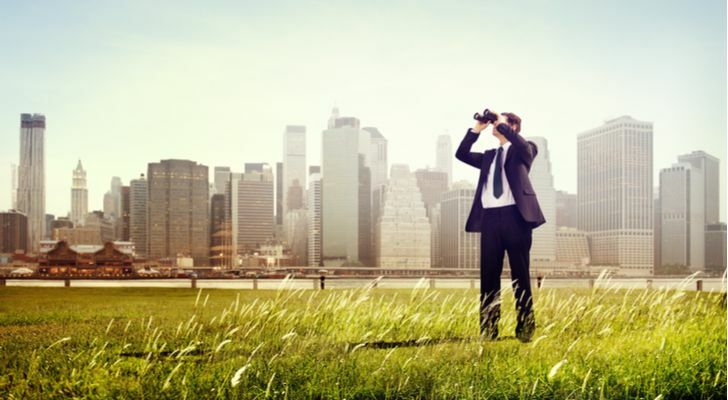 Article printed from InvestorPlace Media, https://investorplace.com/2018/06/10-big-cap-turnaround-stocks-value-hunting-investors/.